Welcome to Day 69 of 100 Days of Disney here on The Purple Pumpkin Blog! Be sure to check out all of the other posts in this series, and if you would like to share your own Disney blog posts or pictures, make sure you check out the #100DaysOfDisney Link Party! 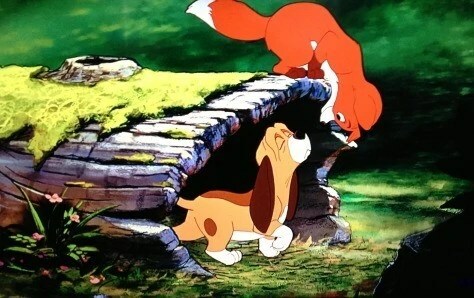 Last weekend my mum dropped me a text to say “The Fox and the Hound is on Channel 5 this afternoon” knowing how it was one of my favourite Disney movies when I was a little girl. I thought it would be the perfect film for this week’s Saturday Night at the Disney Movies. 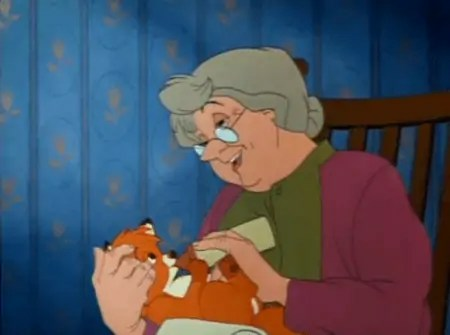 Widow Tweed discovers an orphaned baby fox in her front yard, and adopts him as her pet to keep her company. She names him Tod, because he reminds her of a toddler. The old widow’s neighbour, a hunter called Amos, brings home a hound puppy which he calls Copper, to join his other hunting dog, Chief. Tod and Copper become playmates and vow to be friends forever. Amos gets disgruntled at Copper wandering off all the time, and leashes him in the yard, and then grows increasingly annoyed at Tod, who he thinks is trying to kill his chickens. Chief and Amos chase Tod and are stopped by Widow Tweed. Amos threatens to shoot Tod if he doesn’t stay away. Hunting season then arrives, and Amos takes Chief and Copper into the wilderness for a shoot. 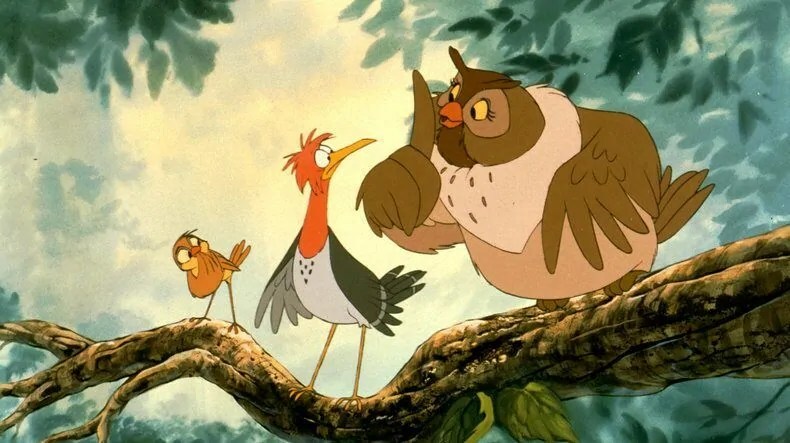 Tod’s friends – Big Mama (an owl), Boomer (a woodpecker) and Dinky (a finch) – however, tell him that he and Copper cannot stay friends because they are natural enemies, but Tod refuses to believe this. When the hunting trio return, with both the young pups now grown, Tod goes to visit his friend. Copper tells him that he’s a hunting dog now and things are different. Chief wakes up and sees Tod, barking to alert Amos. A chase begins, and Copper catches up with Tod, but decides to let him go this once, diverting Amos and Chief away. Chief however decides to continue chasing Tod onto some rail tracks, when a train passes, causing Chief to fall down into the ravine below. Tod escapes unharmed. Copper vows to ‘get him for this’ as does Amos, and Widow Tweed realises that it is no longer safe for Tod at her house, and she releases him at a game preserve. 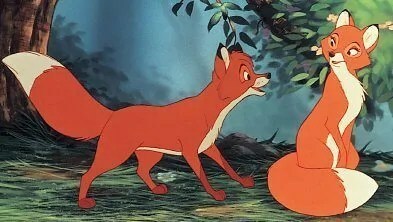 Tod’s first night in the wild is a rough one, but he is eventually introduced to a female fox called Vixey, and they become friends. With Chief injured at home, Copper and Amos trespass into the game preserve to lay down traps for Tod. The two foxes escape the traps, but in the chase, a black bear attacks Copper. He can’t fight back, and Tod jumps in to help his old friend, and they fall down the waterfall to the river below. The bear retreats, and Amos lines up his gone to fire at Tod, but Copper stands over him, realising that he truly was his friend. Amos lowers his gun, and Copper and Tod part ways with one final smile. 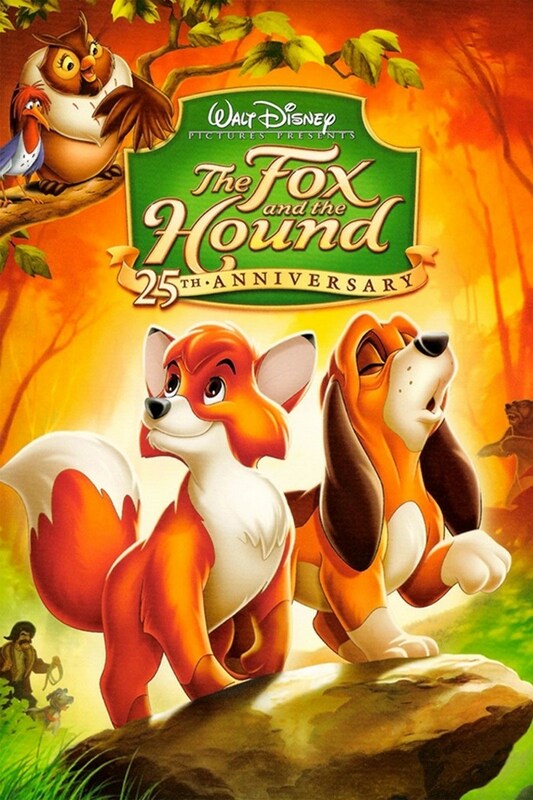 The movie ends with Copper remembering the day that he and Tod met, whilst Tod and Vixey look on from the preserve. This trailer is the original 1981 trailer and I’ve also included the saddest scene in the whole film that makes me cry every time I watch it – yes, even at the age of 37!! 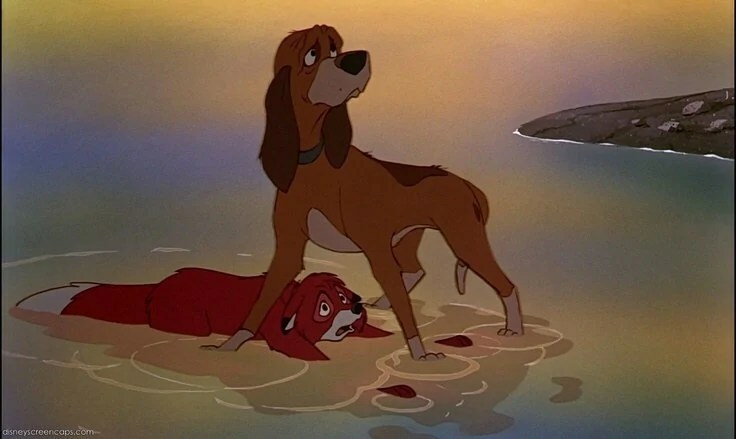 originally, when Chief got hit by the train, he was supposed to die, which was supposed to fully justify Copper’s revenge at Tod. However, some of the crew had qualms against eliminating a main character, mostly because of the risk of the scene being too intense for children. Memories – this film reminds me of my childhood; so whilst the movie itself is actually quite sad, watching it back as an adult especially, it still is one of my favourites. Tod & Copper – their voices as pups are just so damn cute! Especially Copper’s little hound dog howl! Day 69 of #100DaysOfDisney is done – 31 to go!